You will often hear older people criticizing modern parents for letting their kids spend so much time on their tablets. 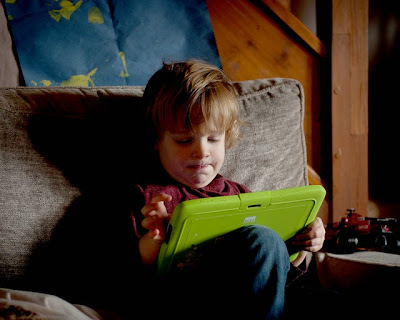 While they are partly right (yes, children should move from time to time), they miss to notice the beneficial side of tablets, i.e. all the apps that can have a great didactic and educational function. Here we are going to show you some of them and try to teach you how to make the best use of these devices and their belonging apps. One of the most important skills that must be developed in children is creativity. In this area, there are numerous apps that are meant to spark your kid's genuineness. In this app, the goal is building objects, in the Minecraft-like way. The great advantage of this app is the concept that a kid can literally build whatever they decide to. A whole battalion of robots can also be used in the game, as assistance to your kids in their block-laying efforts. Toca Builders is definitely worth trying. This app is based on the well-known Toy Story characters. Kids are encouraged to make their own stories with those characters. The app is organized in a meticulous way, so that children pick characters, events and different actions, to create episodes. Also, they can record their own voice for narration. All in all, it is a real imagination-boosting app. Math can become a real boogey-subject in school. However, let your kids see the bright side of this incredible science through smart Android apps. In this innovative education-fun app, kids have clear goal – using a character of a mammoth to move through lava and ice by slicing them. While doing this, children learn fractions. More than sixty fraction puzzles can be solved in this amusing and useful math app. The creators of this app have shown that math (and any other subject) can be an inspiring combination of many things. In this engaging math app, kids are required to fight goblins, trolls and other monsters (visually adapted to young age users) and solve math problems along the way. Thanks to finely graded levels that get harder with every solved puzzle, Medieval Math Battle will be a long-lasting riddle for your kids. Those apps are so wisely designed and they can really help your children help develop some skills. You can turn your kids' tablet into a real learning device, although you will need more memory storage space, so insert an 8gb micro SD card to provide enough space for the apps your kid will be using. However, you have to set clear rules and stick to them, in terms of the periods of the day when they are allowed to use the tablet and the apps. And the most important thing: your kid must be physically active every day. Only then will the use of educational apps come as a meaningful addition to their quality time. The listed apps join two great qualities: being funny and being instructive. But don't neglect other important features of children's development and use tablets and apps only as aides and not the main upbringing/education factors.